The former Aberdeen winger has signed until the end of the season, with the option for a further two years. 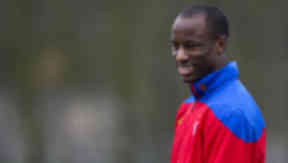 Sone Aluko has completed his move to Rangers, signing an initial deal until the end of the season. The Nigerian winger completed a medical with the Ibrox club on Thursday and will go straight into the squad for Sunday's match with Kilmarnock. Aluko agreed terms on a move to the Scottish Premier League champions on Tuesday and negotiated an option which could see Rangers retain him for a further two seasons. The deal threatened to fall through because his former club, Aberdeen, claimed they were entitled to training compensation for developing the player under SPL rules for three of the four seasons he was at Pittodrie. Talks between the Dons, Rangers and Aluko's representatives on Wednesday saw an agreement struck over a payment, freeing up the 22-year-old to move to Glasgow under freedom of contract. In a statement, Aberdeen confirmed they had reached an agreement which will see them receive "training compensation, potential contingent payments and a sell on clause." Aluko left Aberdeen in the summer, having turned down a new deal. He had been without a club since, training with Sheffield United for a spell, before agreeing to return to the SPL.